I came across a very interesting document today. Interestingly, the document does not appear to have any attribution on it. There is no party logo and no mention of someone taking responsibility for the political comment. 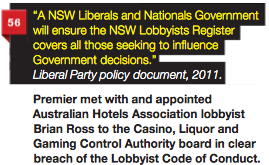 The website itself suggests that the document was uploaded by NSW Labor, which may be enough to satisfy the lawyers. A press release from Labor announces the document, so it is fair to assume that Labor has put it together. The list makes for very interesting reading. Some of it is a little stupid and more than a little unfair, but a lot of what is said is damaging for the coaltion. Starting first with the stupid. You can't count the promise to keep promises as a broken promise in a pretty average attempt to get the total into 3 figures. A number of the promises are alleged to be broken when nothing of the sort has happened, and the writer has either twisted the words of the promise or simply drawn an impossibly long bow. Some of the promises were made with a longer term view or in a general sense, meaning that any allegation that they had been "broken" is pretty unfair. 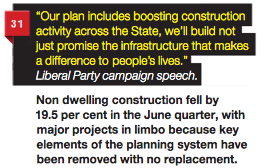 Several of the alleged promises were statements that the Coalition "had no plans" to do something. It may well have been a lie, but it isn't a broken promise. There are still other cases where no promise was made at all, or where the alleged "breaking" in fact had nothing to do with the promise that was made. Other allegations of broken promises are in fact plain distortions of the truth. 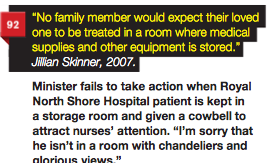 I think those are fair criticisms of the pamphlet. The writer(s) of the document have made that far too common mistake of over-reaching - rather than having 50 perfectly valid, defensible criticisms, they go for 100 criticisms where half are confusing, deceptive, tricky, or just outright lies. 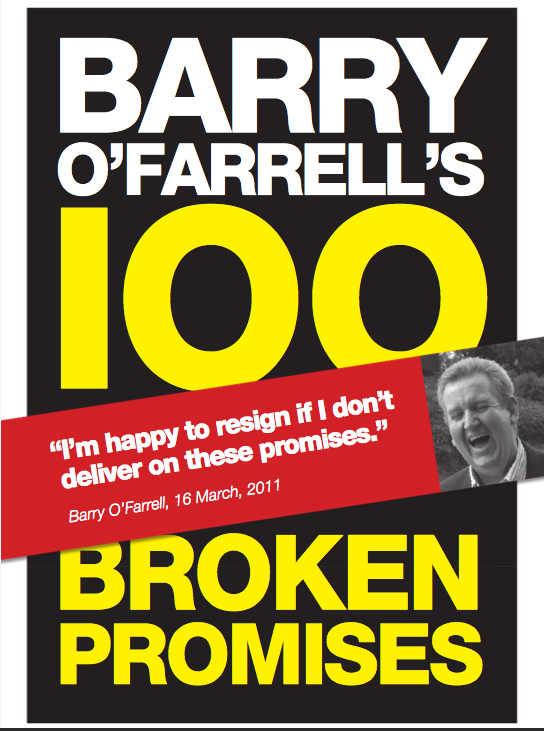 This is important because there are actually a lot of places O'Farrell can and should be criticised when it comes to broken promises. Why Labor had to overreach and make a whole bunch of allegations that were not reasonable when there were so many perfectly good options available remains a mystery to me. He's probably right in terms of forcing good governance, but when it comes to showing up a government for its weaknesses, Labor are probably on the ball here. 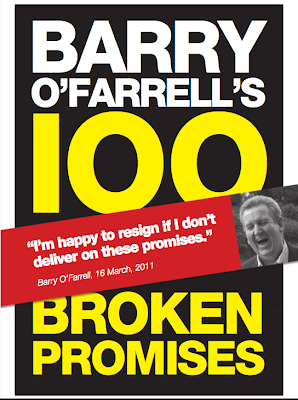 O'Farrell has broken a lot of promises, and no doubt there is a small but growing discontent. This may well end up being the issue that makes the next election more competitive than it really should be. 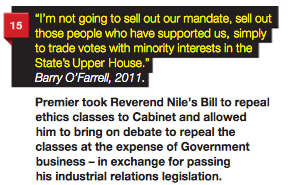 If Labor can continue hammering the "Promise-breaker" line then people may start to switch off from the Coalition. WIll it be enough to win back government? On its own, probably not. 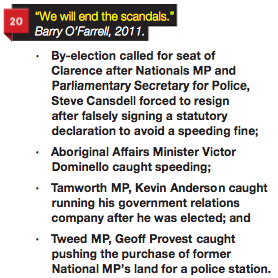 But by reneging, delaying and obfuscating the O'Farrell government is giving Labor an "in" they don't really deserve. A final point - I don't know what the purpose of this document is, or how it is planned to be distributed. I came across because of a tweet I randomly happened to notice (and now can't find). As I have said above, I am not sure if the document is "legal" in its present form. 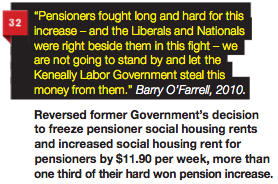 I found this press release on the NSW Labor website which draws attention to the broken promises and provides a link to the pamphlet, but it is hard to imagine that many people other than Labor loyalists and political wonks would ever visit their site at this point in an election cycle. Exactly why a journalist would write about this is also a little unclear to me. In any event, there it will sit and probably not be read by many people. 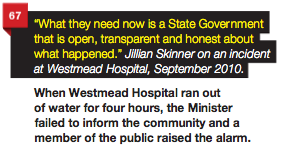 An example of a government not keeping a promises and an opposition overreaching in trying to criticise the government. Not a great pamphlet for either side, really. 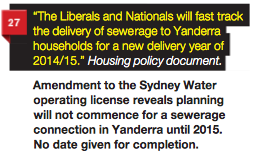 If you tried to post a similar "pamphlet" based on the previous ALP government it would break the internet. 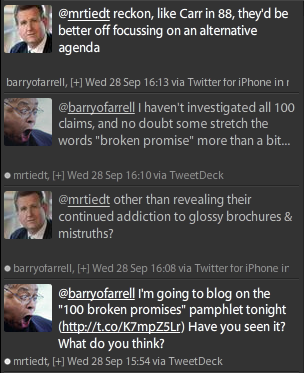 Good run-down on the list of promises. Can't say I ended up reading through all of them (it was a long list, even summarised! ), but your conclusion seems about right. I think criticism like this could work at the end of a full term or at some point in a subsequent term. But right now it just looks like something opportunistic: "Look, they haven't done something the promised after only 19% of their time in office has elapsed!!"